The tournament was over and the week was drawing to a close. It had been a fantastic experience, one that will never be forgotten. 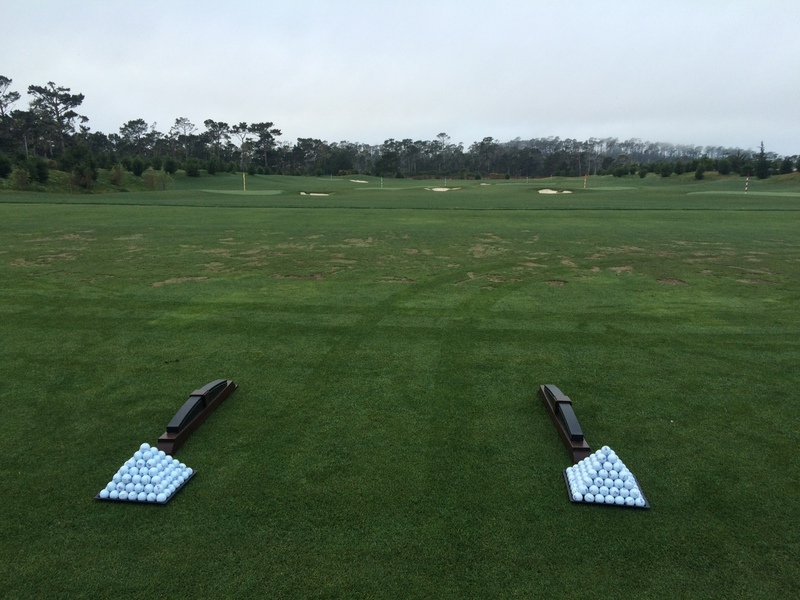 And, there was still one thing left to do… Play Pebble! The entire group was super excited about this. One last big blast of an experience that we were able to do together. All four of us had become very close over the week and it is hard to imagine a better group to play Pebble with. We all had the commonality of golf tying us together and getting to play one of the most famous courses in the world was something that would strengthen the bond that had already been building between us. I think that’s one of the best things about golf: sharing the experience, both highs and lows, with a group of friends old or new. At any rate, Pebble was going to be played and we also had the pleasure of playing it the day after the tournament and from the same tee boxes as the pros and to the exact same pin placements. All they did for the Monday round was pick up the flags, mow and roll the greens and then replace the flags. It was a good challenge and after seeing how the PGA guys played on Sunday it was also a great yardstick for my own progress. 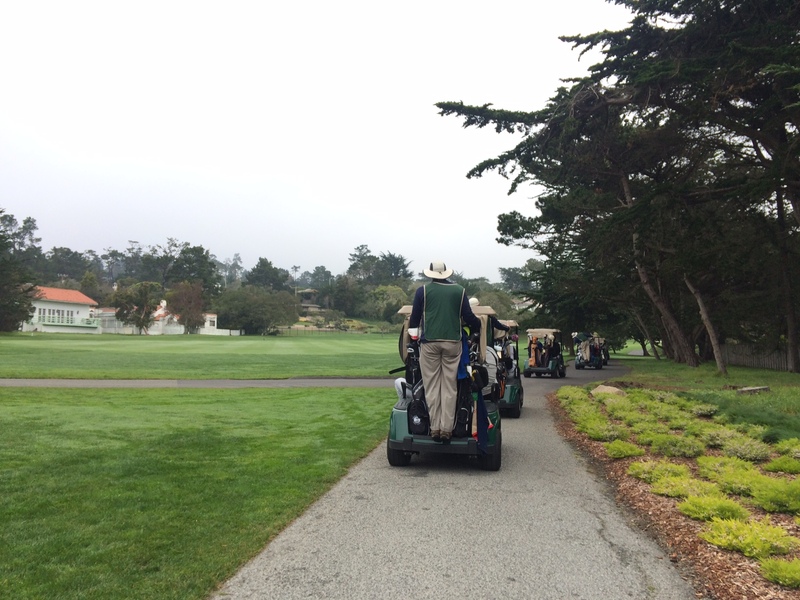 After that it was just about hearing the rules and getting everyone together (it was a shotgun event so all of the players had to gather on the first hole and get in their carts) before heading out for the round. And then we were off. We followed the lead and worked out way to the 15th hole which was where we would start the day. The 15th was a good hole to start on. You tee off through a shoot of trees and then the hole opens up pretty wide, although there are a number of bunkers throughout the fairway. It is a forgiving hole, but one where you have to be relatively straight off the tee, although can hit anything from 3-iron to driver. I decided to give driver a whack and was so nervous on the tee shot that I could tell I was shaking a little. 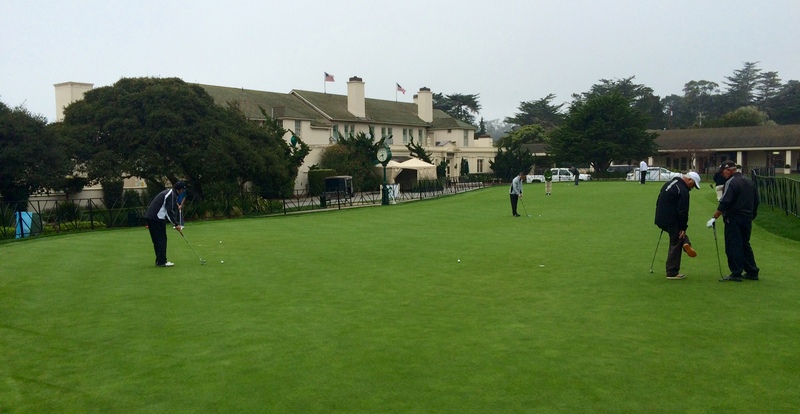 The thing is, playing Pebble for the first time is like going on a date with someone way out of your league. I hadn’t felt anything like this on any of the other hundreds of courses that I have played in my golfing days. 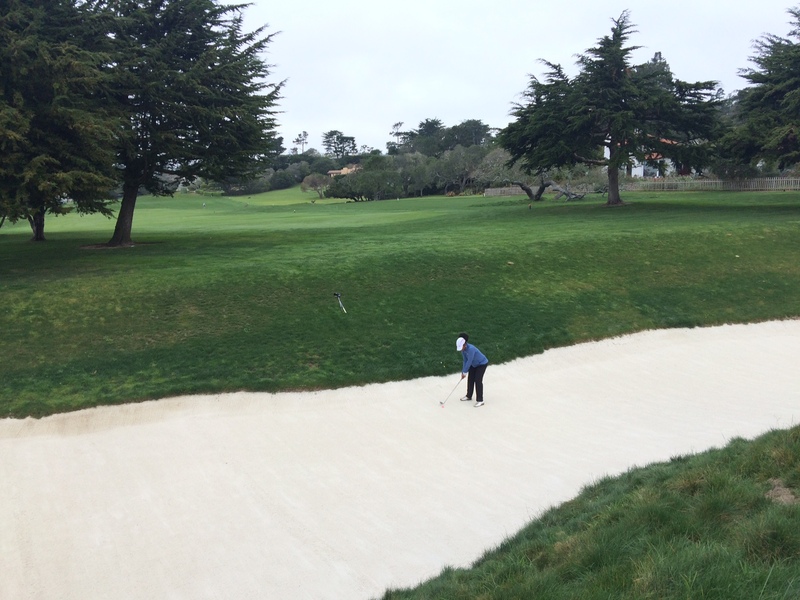 On pebble, you just wanted to please the course and not say/do anything stupid. I felt like it took a handful of holes to really relax and even then you got up to the tee boxes of some of the iconic parts of the course and it was very hard to calm down and go through a normal routine. I’m not sure if I’ll ever have the chance to play it again, but it’s one of those courses that take a few rounds under your belt in order to really just play the course. Just too amazing, truly. On that first hole I was visibly shaking and nervous, but managed to move the ball more-or-less forward. I pushed it a little but it was findable in the rough. After we all teed off we did some poses for a few photos and were already running a bit behind. Tim parked on the cart path (it was cart path only, but carts were enforced this day) and I ran across the fairway to speed things up a bit just to realize that I had not brought the right club, so had to run back and grab a 7-iron and then run again across the fairway. My heart had been racing before the round even started and now it was out of my chest. I squared up and tried to make a good approach shot, but again pushed it and it clanked on the top of the bleachers next to the green. Probably would have seriously injured someone, but luckily there were minimal observers this day. The ball bounced off the grandstand and I had a nice pitch up to the green and then just barely missed the par putt. Started the round with a little bogey. On the 16th hole I hit hybrid and then an 7-iron which landed about a foot short of the green but was on the pin side so hit a tiny chip to a foot and made the putt, my first par at Pebble. 17 is a classic Pebble par 3. Longish hole with a very small green. On this day it was playing into the wind as the clouds and wind had picked up on Monday. The pin sits on the left side of a kidney shaped green playing right at the ocean and the distance was 188 yards to the hole. I decided to try and but a 4-iron to take a little off but allow for wind and it landed pin high which was awesome. What I didn’t realize was that pin high on the right side of the green was perhaps worse than landing short in the bunker on the left side. Katie ended up there too and we literally didn’t have a putt. If it was the tournament I would have hit a flop shot off the putting green over a hump, but seeing as we didn’t want to take a big pelt on a Pebble Beach green we both putted and ended up about 20 feet below the hole. It was literally as good as we could have done for the putts we had. Two putted from there for another bogey. Live and learn. And then there was the iconic 18th. 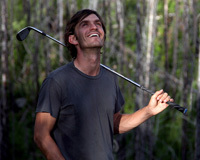 I was so happy that we didn’t start on this hole as I wanted to be warmed up and in it by the time we hit the 18th. Such an amazing golf hole. Being a lefty with a tendency to draw the ball on this box with nothing but water out to the left was a bit intimidating, but it also forced one to make a good swing. I cut the ball along the fairway with the ultimate goal of hitting to the tree that’s 280 yards from the box. Ended up nicely just through the fairway in the first cut of rough. I don’t have a 3-wood with me right now and the thought of going for it with a hybrid didn’t sound too tempting so I laid up with an 8-iron to a good number: 120 yards. I had a good club in my hand and a great number in front of me. I wanted to stick it close, but honestly was looking around too much and in the moment just didn’t focus well and pushed the shot to the left side rough about 2 feet off the green. It was disappointing as I REALLY wanted to birdie this hole, but it was what it was. I chipped up to about 4 feet and thought I hit a great putt but it broke the exact opposite way which it seemed like it would and lipped out. Had to settle with a bogey. This was a common theme out there. Everyone said the ball breaks towards the water, but without having a caddy help read the putts they were extremely subtle and hard to figure out. Yet another reason why it would be amazing to play a track like this a handful of times. Next time I’m there a caddy will definitely have to be a part of the round as they could have saved me a handful of strokes this day. We were having a great time and playing an amazing course so it really didn’t matter, but it would have been nice to make a few of the putts coming up after this hole ;). We made the turn to number one and my hybrid off the tee pushed left. 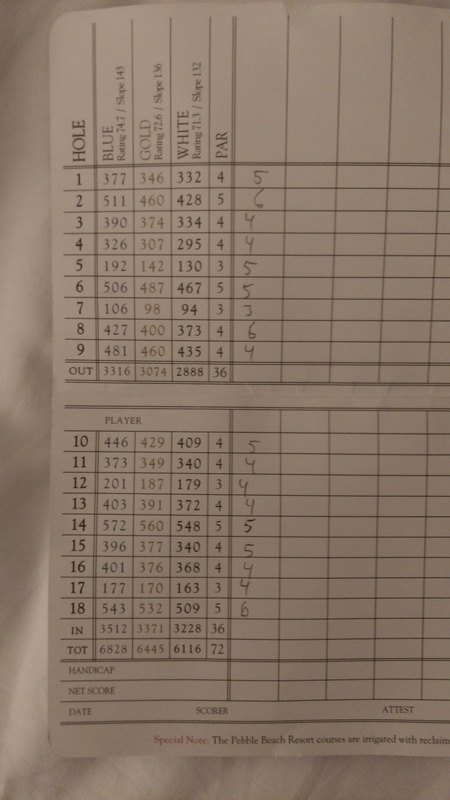 I didn’t have a look at the green so had to punch out, hit the green and two-putted for another bogey. It’s way deeper than it looks, probably about 20 feet down to the bottom and maybe 50 yards from the green, just a pure tough shot. I hit a layup but unfortunately went too far even thought I thought I had played it totally safe with an 8-iron. Ended up blocked by one of the trees and had to punch out and then hit the green and 2-putt bogey. At this point I was ready to start playing some better golf. The third hole is one that you can either play it safe and hit a 200 yard shot to the fairway or go over the trees with a driver. I took the tree route and hit it to about 80 yards. Finally connected well twice in a row and had a 5 footer for bird. Miss-read the putt and tapped in a par. The 4th is an uphill par 4 with bunkers riddled throughout the fairway and ocean on the right side. I hit driver to about 70 yards and then stuck it to roughly 5 or 6 feet and again didn’t read the putt right and had to settle for a tap in par. The greens were just tricky. It made me appreciate both the putting and the caddy-knowledge that goes on Tour. You have to both be 100 percent confident in the putts you are making and also really know where they are going to fall. Being my first time on this course I had neither of those things. The 5th was a long par 3 with a postage stamp sized green which I doubled by not wanting to go in the ocean so ended up going OB down the opposite side and had to re-tee for the double. Then was 6, 7, and 8, which are some incredible holes. The 6th is a par five where you tee shot is sent about 80 feet downhill and then the approach shot is the same distance above your head and completely blind to where you need to hit it. The tee shot is easy enough being pretty wide open as most holes are out there, just don’t send it in the ocean and you are gold. Tim and I both hit down the left side thinking the bunkers were out of play due to hitting into the wind, but mine landed about 3 feet short of the bunkers and his bounced in. From there I tried to hit a 5-iron up the huge hill not really knowing what to aim for but it didn’t climb enough to get up and ended up in the deep rough 90 percent to the top. I hit a 9-iron from there, but again didn’t know what my target line was and ended up pulling it into the green side bunkers. I hit the stick on my bunker shot and it landed just a couple feet from the pin, made the putt and walked off with par. And then there was 7. The shortest hole on the PGA Tour playing just 100 yards and very much downhill. It’s a classic and when the wind is howling I hear it can be brutal. Today was just a little windy, but there are still bunkers surrounding the green as well as ocean on most sides of it. I punched a half 50 degree that looked right on the hole but the wind kind of knocked it left and it landed bout 5 feet from the hole. This was another of those holes that you really want to birdie (not that all golf holes aren’t exciting to birdie, but some are just precious) and I knew it would break “towards the water” but there was water on three sides of my so which water… I just putted straight for the hole as I didn’t want to over read anything and it ended up breaking left a hair more than the cup had to offer. Tap in par, which wasn’t too bad all things considered. I double 8 as I duffed my approach shot, which is a 200 yard shot way downhill over a huge ocean gorge and then had to hit it on the green and two-putt for the double. The 9th was one where I kind of expected to bogey but was pleasantly surprised to make a par. It’s was a par 4 playing 481 yards with ocean breeze pushing the ball left. I didn’t connect well and poorly pushed/sliced the driver left into deep rough. From there I didn’t have a great lie and was about 230 yards to the hole with a gorge and bunker between me and a pin that was tucked into a 8 square foot section of green. I decided to lay up with a gripped up half swing cut hybrid and hit a good one down the left side. With 50 yards remaining I hit my 58 degree to about 2 feet and finally made a putt. That was by far the hardest and longest par 4 that I have played to date and I was ecstatic to have made par. I three-putted the 446 yard 10th for a bogey after hitting a great approach shot that unfortunately ended up above the hole and I miss-judged the pace. 11 is a shorter par 4 that I hit in two and made par on and then the 12th is a 200 yard par three with a green that must just be no more than 5 yards deep. When I walked with Jason Day and Charlie Beljan I knew it was a tough hole when both of them missed the green, and kind of by far. I ended up short sided on the left of the green and made a good flop shot, but it rolled out and it took two putts to make the bogey. The 13th was the first hole where I felt like I finally “found” my driver and hit a decent driver shot. It’s always unfortunate to find it late, but great to finally have found it! I hit it right down the middle on this uphill 403 yard par 4 and had a pretty simple 9-iron to the green. I pushed it a little and the ball bounced on the green and then hopped off and bounded down the hill to a tricky little pitch shot to the elevated green. Made a good one as well as sank the putt for a par. Our final hole was a great one to end on. It’s a 572 yard par five that has such a crazy green I didn’t seen anyone go for it in two all week. The part of the green that the pin is perched on is about 10 square feet and to the left is a huge hill of rough, in front of it is a crazy bunker and to the right the green slopes down at least 6 straight feet to another tier. The play is to hit a good drive and layup to your gold number. I hit a decent drive but then sliced my hybrid far somehow. I had to then hit an 120 yard shot over some trees to the tiny island of a perched green and thought I hit it masterfully, but it turns out the ball clipped a branch coming down and ended up on the hill of rough. I chipped it on and the ball rolled down the hill to the lower tier. I had no clue what the putt was going to do, but somehow managed to get it in the hole. It was truly blind luck, but an fantastic way to end an incredible day. I know there is a long way to go from where I am to where I want to be, but after watching these guys and then playing the same course from the same boxes and tees I have a deeper understanding of what I need to do to get to where I need to be. They definitely do everything better, as they should. But, if I had the same skill-set test a year or two ago I don’t think that I could have sniffed the 80s. There is a lot of work to be done and that’s the whole point. I, very hopefully, look forward to having similar opportunities in the future as this was a great way to see exactly where I stand compared to the greats. In comparison, they are still great and exactly why it is so fun to watch professional golf. Over and out for now. I have been back in Portland for a few weeks and the season is about to kick off. My second “tournament” (it’s a team event so still not exactly tourney) is a two-day event next weekend and I will definitely be posting about how it feels to start a brand new golfing season. I am very excited the winter is ending and the golf is starting back up. 3 Responses to "The most amazing week, continued and finalized"
Great experience, and perfect timing. I’m reminded of how the top tier soccer teams around hear like to start their spring season. They are always looking for what will be the toughest game of the season, that won’t demoralize the team, as they set up their “friendlies”. Show them what is possible, what needs work and leave the players hungry. A trip and experience of a life time. Great job Dan!!! Wrong plan. Notice that you missed the green after that. You haven’t yet read Lowest Score Wins, have you? You know what you need to work on… but you don’t share that here. What is it? Also, go take an AimPoint class. No way you should be misreading the direction a putt breaks.